Ad agency and media bible Brandweek magazine is reporting Carnival Cruise Lines will soon debut a new ad campaign under the tagline "Fun For All. All For Fun." This has been highly anticipated, since Carnival dropped CooperDDB for Arnold in June 2008. Arnold was the agency of record for Royal Caribbean until December 2007. The new campaign will start Oct. 26 in Dallas with a World Record attempt to create the biggest beach ball followed by the largest pinata Nov. 2 in Philadelphia (details below). According to Brandweek, footage from the events will be used to create national TV spots. 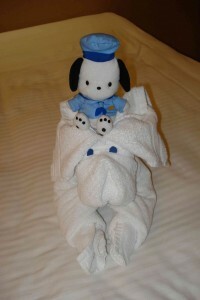 Other advertising includes a series of online videos based on Carnival's "get your pod chirping" in-room activity - the towel animals (pictured here with a soft toy friend who apparently wants to get in on the act). The online clips are at www.carnival.com/funville undoubtedly with the hope of going viral on the likes of YouTube and other social networks. The first event is Sunday, October 26th at 12 noon at Pegasus Park in downtown Dallas. The World's Largest Beach Ball is 35 feet tall or about 3 stories. Senior Cruise Director John Heald will be in attendance tossing around the humongous beach ball. The second event is in Philadelphia's City Center at North 20th and Market streets on November 2. The World’s Largest Piñata is 62 feet tall and 55 feet long or about six stories - and filled with 8,000 pounds of candy. Click here for an on-the-spot account or here for an ad age video wrap up.